Pacific Coast Cabins are rugged luxury cabins, handcrafted with environmentally friendly materials, custom built, flat-packed and delivered to your location. ​These round house kits easily assemble into ﻿rural guesthouses, beach huts, art studios, or rental units, and are ideal for eco-resort lodging, luxury camping and affordable housing. our cabin design was inspired by a love of wild and beautiful places. ​Humanity has enjoyed the benefits of round shelter for well over 10,000 years. At one time, round symmetrical shelter enhanced survival by providing the most stable structure. Today, a round home provides a strong sense of comfort and well being by reflecting the natural environment humans evolved in. A round hut was also symbolic at one time, as well as practical, in that it once served as an "imago mundi" or model of the cosmos. Indigenous peoples who viewed the world as naturally round and interconnected modeled their shelter to symbolically reflect that experience. All around the planet we find round shelter to be the very first living space constructed by humans. Structures such as the African rondavel, Navaho hogan, Lakota tipi, Samoan beach fale, Fijian bure, North American wigwam, Anasazi kiva, European roundhouse, Mongolian yurt, the round homes of Jericho, the first known town, Inuit igloo and others, all provide round living environments. A round structure reflects for us the shape of the natural world. Biomimicry, the modern practice of imitating nature in design, encourages us to build structures that resemble the natural world, and to design for well-being, not just for survival. Research shows that built environments affect our emotional and cognitive well-being and that successful architecture has the ability to reduce stress. Rounded features are found to be more attractive and relaxing than rectangular features. A functional MRI study conducted by the National Academy of Sciences showed that "participants were more likely to judge spaces as beautiful if they were curvilinear than rectilinear." Our human preference for natural materials may be a product of biological evolution. Surrounding ourselves with natural materials connects us to the real world. Wood may be our most environmentally friendly building material when sustainably harvested. Pacific Coast Cabins are rounded, prefabricated kit houses built with sustainably harvested redwood, pine, fir, cedar and reclaimed lumber. Our cabins are free of the toxic building materials often used in standard residential construction. No vinyl, paint, plastic, varnish or urea-formaldehyde is used in our kits. 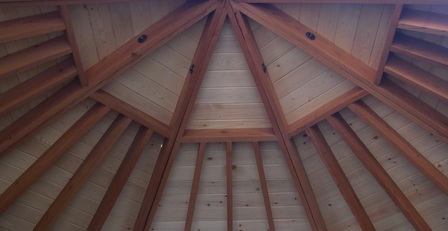 We use only wood, steel fasteners, building paper, steel roofing, plywood and natural oil finishes. These cabins rest lightly on the land with an expected lifespan of well over 50 years, yet can be set up to be disassembled, moved, or stored flat if needed. Light, semi-permanent foundation work can be used, and then removed virtually without a trace if desired. Our prefab building methods generate 50-75% less waste than conventional construction. We do everything we can to build high-quality, life-enhancing shelter without harming the natural environment. Nature is our best reference point. "We have nothing but good things to say about Pacific Coast Cabins...a joy to work with from start to finish. The cabin feels custom and serene and exceeded our expectations. Thank you!" - C.A. "Outstanding design and beautifully constructed. I would highly recommend this company" - W.R.
"The cabin is a joy to inhabit..... feels expansive, warm and light. It has been carefully crafted with an aesthetic attention to detail...... Plenty of enthusiasm, creativity and good vibes went into the construction and it was a pleasure to work with Pacific Coast Cabins." - G.K.